Ingredients for birthday card I just made for my son, Apollo. First let me say thank you so much for all the love you lovely ladies left on my blog last week. It was the lift I need while dealing with this foot pain. This week’s update: I am thinking of seeing a chiropractor for pain in my back and left side that might possibly be contributing to a miss alignment hence the foot problem. My doctor is leaning towards Planter Faciatis. My inserts (not custom orthodics) don’t seem to be working so we are going try another before committing to the hefty price for custom orthodics. I made it to many desks last week but promise to get to anyone I missed this week. So I have a hording tendency that doesn’t allow for me to part with my newest pretty stuff. 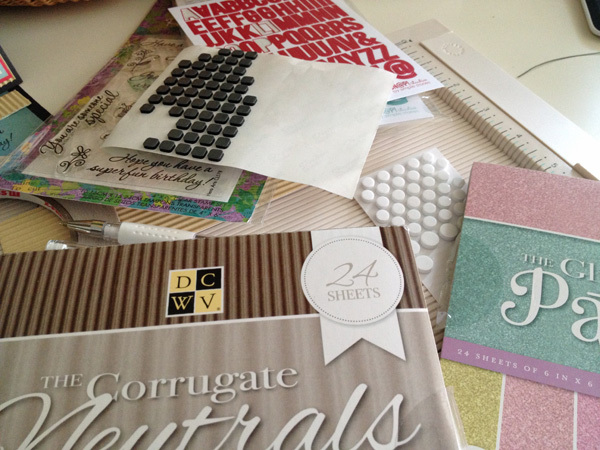 So today I actually broke the seal on two new paper packs I have (corrugate neutrals ad The Glitzy Pastels by DCWV). I used my Silhouette to cut out the cute balloons. Have I said lately how much I love my Silhouette? Well, I do and the best part is that I haven’t even scratched the surface. I made a easel card base. I really love cutting and scoring and prepping the base. More will definitely be made. You can click here to see my post that has the completed card. Previous PostHappy Birthday to my sweet boy, Apollo! Thank you Patsy! That means a lot because I wonder what others’s think of the blog. I am trying to get into a good posting rhythm so that I can get regular visitors. Yes I am so happy and feel blessed to be a part of WOYWW. It is a very inspirational and I am meeting great crafting friends. I’ve seen that corrugated paper in the stores, but never bought any. Lucky, lucky you. I have a friend who got those custom orthodontics. She has tons of trouble with them because they have never fit her properly, and she paid over $6500 for them, and they weren’t even a complete set. Good luck. Hope you find a better alternative. Happy WOYWW from # 2. Beautiufl paper pads and creativity in motion, good for you getting some crafting done. Thank so much for sharing your desk, very interesting and that card, I think it is a card is looking good. Good luck with the doctors nothing worse than being in pain this I do understand at the moment. Stay positive, craft it helps take your mind off things. 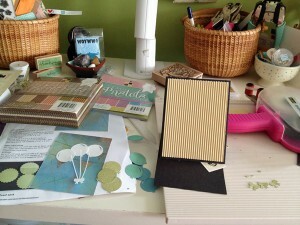 lovely stuff on your desk – I like the muted colours! I hope you get your foot problem solved. Sending you healing thoughts and prayers. I’ve seen a lot of Silhouette projects and I really want one!!! happy WOYWW! And I also meant to say that even if you say you can’t draw, you could surprise yourself as my daughter did (I wrote about her here- http://peggyapl.blogspot.com/2012/04/so-you-think-you-cant-draw.html). you can also try the “tracing method” and the key is practice, practice, practice. I have custom orthodics for pronating feet. I have not noticed any change in the pain from hip where I had replacement. So try all avenues first. Nice card and use of the papers. Make yourself use the paper or it will out live you. Sorry to hear about the pain and discomfort you are in. Hope it gets resolved. I am lucky in that I have orthotics made for me every 12 months and at the moment do not have to pay for them. Must say that I have had them for years and really cannot walk without them now. I also have podiatry every two weeks but that is private and costly. Can’t say the orthotics have stopped all the pain but they do help. Great papers and I love those balloons you have cut for your cards. I hope you get a proper diagnosis on what’s causing you the pain soon. Have a great week! Danie #62.